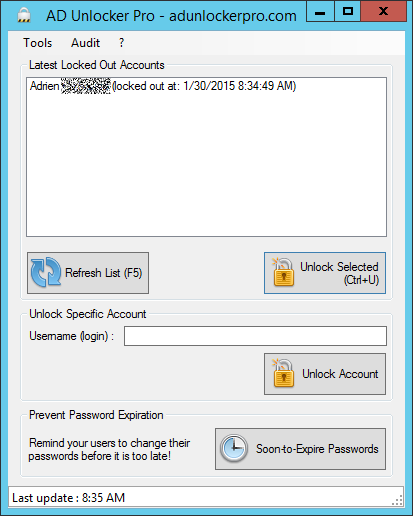 If you're looking for an easy-to-use, plug-and-play solution for managing locked out users in your Active Directory, then your logical choice is AD Unlocker Pro. 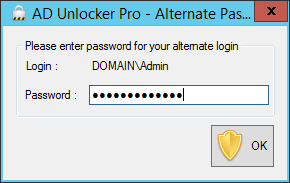 AD Unlocker Pro is a small application that will automatically search current Active Directory for any locked out accounts and display the related usernames. Unlocking these locked out accounts is only one click away! Every functionality is available in a user-friendly graphical interface, so you don't have to use command line. You will not anymore have to remotely connect to your Active Directory server just to unlock an user account! IT Support and Help-desks staff get more efficient with AD Unlocker Pro, and they can unlock accounts faster and even before end users open a support ticket. Win time, become pro-active : try now AD Unlocker Pro! If you have administrative rights on your Active Directory, no configuration at all is needed! 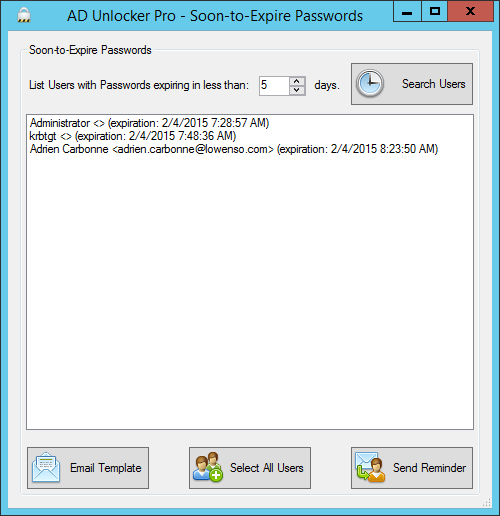 AD Unlocker Pro will automatically detect your current Active Directory and use your current user account to connect to it. Otherwise, you can use an alternate login that has privileges in Active Directory. Users may be unaware of their password expiration dates, or how to renew it, or maybe just forgot to renew it. 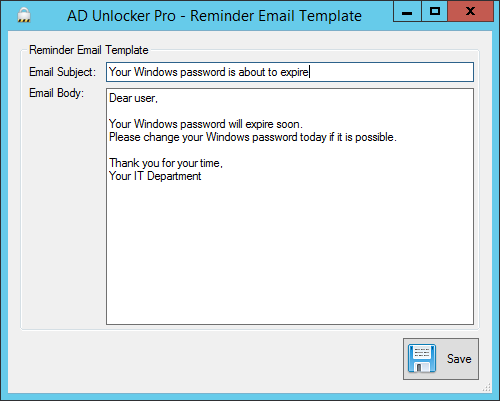 Using AD Unlocker Pro Soon-to-Expire Password feature, you can monitor the users whose password will expire soon, and avoid service's downtime and sometimes daunting situation for your IT staff by emailing reminders to those users. With AD Unlocker Pro Soon-to-Expire Password feature, your IT department will show to the Company employee - and its management - how well managed IT is. Prevention both looks great and strongly reduce users tickets/calls to your IT Support Team! Of course, AD Unlocker Pro allows you to customize the Reminder Email that will be sent to users close to their password expiration date. 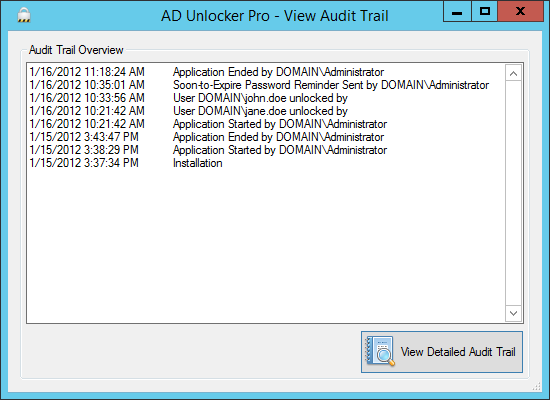 AD Unlocker Pro includes an Auditing feature and will log every action done with it. This feature is great for Administrators who have to be compliant with a strict Corporate policy. In any cases, auditing is a precious tool to help Administrator guarantee the security and good management of their IT infrastructure.